SOME People are talking about Gary Ballance with England at the minute and for me, it’s funny how everyone said he had a fantastic trip to the West Indies and now two games in with not many runs, the TV cameras start pulling his technique to pieces. He has got a method that works for him and, overall, he has a fantastic record so far in Test cricket and he has really taken to it well. He just needs some time at the crease and playing Test cricket is a tough place to get that. 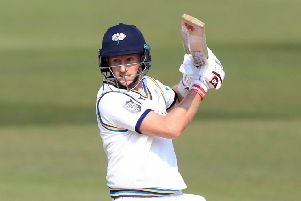 Now he is not in that one-day squad, he will get a bit of time with us at Yorkshire and I am sure he will be hungry to score some runs ahead of the Ashes. I went away with the family for the weekend, but I managed to see bits of the New Zealand Test at Headingley and with Lythy scoring the runs like he did, I made sure I hooked up somewhere and watched Sky TV and it was fantastic to see him reach three figures. It was a big Test match for him and on home soil as well. He’s secured that place for the Ashes and it’s a big achievement for the lad and he showed his class for me. I am sure he will get his chance now, given that he has scored his runs. He’s secured his place for me for a few Tests and with the Aussies coming to town, he’s going to get a chance to go up against Australia, which is every England players’ dream really to play in the Ashes. In terms of the Test at Headingley, I thought it was a fantastic spectacle. The way that New Zealand played and bounced back was outstanding. The leadership of Brendon McCullum and the way he galvanised his team and played positive cricket was inspirational really. To score the runs they did in the second innings and at the rate they did ended up really taking the game away from England. I think England can learn a few lessons from the way that New Zealand played and if they can play that brand of cricket in the Ashes, then they will be successful. We’ve had a quiet week or so at Yorkshire and have had three full days off, which I think we needed. I think the lads were a bit tired after Somerset and Durham and there was a fair bit of travelling, so it was a good opportunity to get some time away from each other to refresh the batteries. On Tuesday and Wednesday, we have two good Twenty20 practice days and two pretty full-on and intense games between ourselves. The weather has been good as well and we trained and played at Weetwood, which was good as well – ahead of the full house versus Lancashire. We have mixed from red ball to white ball of late and for us, the big thing is finding the time to practice both. This week, we were probably thinking about Friday night and getting our skills right for the Twenty20 Roses game. But then you get to today and you have to train for red ball cricket, with the Middlesex home game, which starts tomorrow. After the intensity of Friday night, there will be a few tired bodies around today and you sometimes don’t get the intensity that you want. The hardest thing is finding the right balance in training. Ryan Sidebottom is on the mend and he played in the Twenty20 games this week and performed well. We are saying that the ‘Rolls Royce’ is back and he’s raring to go. I know he’s missed playing and he is available for Sunday’s game. Aaron Finch is also not too far away and he gets here either on Sunday or Monday. He’s been texting and saying he is getting over and he is pretty bored of all his rehab now and he is ready to get playing for us. He will hopefully be available for the T20 game against Northamptonshire at the back end of next week. We were very disappointed with our loss at Durham at the end of last week; it was a game we should have won really. We didn’t bowl particularly well up front and went for 76 runs at the death in the last five overs with four no-balls thrown into that as well. We were probably chasing 30 more runs than we should have been really. It was a pretty good effort in the end to get within six runs of the target. But it was still a game we should have won and, hopefully, we will not look back at it with too much regret. We have learned some valuable lessons from that game, for me.